The efficiencies of cost and time for design of tooling for sheet metal bending or plastic molding have vastly increased – thanks to Manufacturing Simulation (MS). MS has revolutionized manufacturing engineering by allowing virtual runs of the manufacturing processes. The CAD morpher and associated modules from DEP further enhance the benefits of MS. Anyone familiar with manufacturing can attest to the fact that shrinkage and springback could be terrible enemies of the designer. 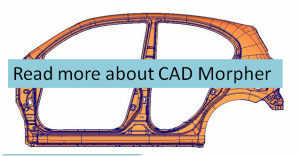 CAD morpher modules ensure high fidelity of parts produced by imposing a deformation or correction on the tool based on measurements on the actual part to account for spring back or shrinkage. The CAD morpher can thus be used both for tool face corrections as well as weight optimization of the actual part.